This drill called “Lane Line Ball Pressuure Drill” and is among the thousands of resources for both coaches and player available from basketballhq. They have several more videos as well as basketball coaching resource articles. The Coach in the video is Brian Baudinet, formerly an assistant coach with the NBA D-League Tulsa 66ers. Since the video was made, Coach Baudinet has taken a position with the Duquense University Men’s Staff as the Director of Administration and the Tulsa 66ers are now known as the Oklahoma City Blue. The drill can be modified to fit your needs so that it becomes your own and used during your fall skill development workouts (where those are available) or can be used in practices this coming season as well. You could change the restricted area, change the scoring, change the length that the dribbler must attain, change the number of seconds the dribbler has, or make any other changes to fit your players and your philosophy. 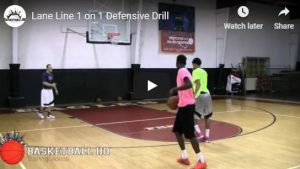 Like every other drill, the teaching points in the video, or that you use when you run the drill, for both the offense and the defense are what determine the effectiveness of the drills in helping your players improve. If you have 3 or 4 players in the drill, you can have the winner of each rep stay and the loser goes to the back of the line. You can also make it a ball toughness drill by having a coach or manager be the defender and allowed to use their hands (within reason) or a blocking pad to overload the dribbler. To score a point in the drill, the defensive player must keep the offensive player from getting to the free throw line, staying with the lane lines, in 4 seconds.